Dr. Marjan Abbasi, MD CCFP (COE), and Dr. Sheny Khera, MD CCFP, felt there had to be a better way to meet the health and social needs of older adults with frailty in primary care. They worked together to develop a program that mobilizes existing Edmonton Oliver Primary Care Network (PCN) resources to maintain and enhance seniors’ health and wellness and builds integrated primary health care that is centered on the goals and priorities of older adults. And with this, the Seniors’ Community Hub was created. 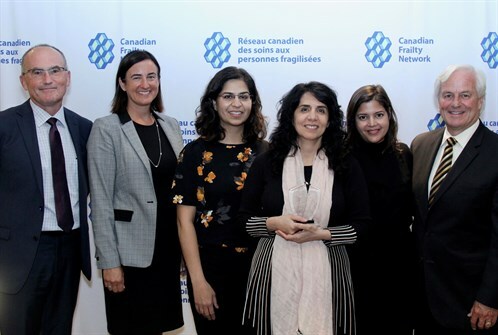 The program has been so successful that it was recently selected as the Top Frailty Innovation of 2018 by the Canadian Frailty Network, from 80 entries across every region in Canada. The Seniors’ Community Hub initiative transforms primary care into a central hub, bringing together family physicians, PCN resources, specialists, and social and community support services to promote healthy aging through integrated person-centred care. The program enables effective information sharing between patients, care providers and settings, and it provides community-based support to family caregivers to prevent or alleviate caregiver burden. The Seniors’ Community Hub equips primary healthcare teams with the knowledge and ability to inspire healthy aging and to proactively support patients living with frailty and their family caregivers to maintain their intrinsic capacity, strengthen their resilience and, ultimately, mitigate frailty. This has been achieved by the program’s structured process of care, education of the healthcare workforce, patient and caregiver empowerment, and building partnerships in care. Successes of the program have been improvements to quality of life with better or maintained patient independence, acquisition of self-management skills regarding health and medications, and improved chronic disease management. In addition, there is better access to community resources through navigational support, a lower sense of burden by caregivers, and stronger connections to the patient’s medical home and community. The Seniors’ Community Hub is gaining traction with a number of primary care practices in Edmonton.